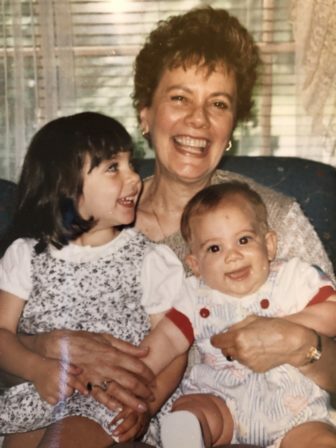 Claire Pesin holds two of her grandchildren before she was diagnosed with stage 4 lung cancer. Her daughter, Amy Edwards, is advocating for legislation that would legalize aid in dying. In the last year of his life, Dan Pesin begged for a lethal dose of medication to end the pain that had gripped him since his colon cancer began spreading throughout his body. His daughter, Amy Edwards, suffered along with him as she watched him decline. Edwards is one of dozens of Connecticut residents imploring lawmakers to support a bill that would let terminally ill patients access medication to end their lives. A public hearing on the so-called aid-in-dying legislation is scheduled for Monday at the Legislative Office Building. The measure has been raised many times in Connecticut, including as recently as last year, but has never made it out of committee. Proponents said they see a way forward this year, buoyed by the state medical society’s decision to end its opposition and by a legislature that seems more open-minded. The bill would allow doctors to prescribe a lethal dose of medication to patients who have six months or less to live and who are in dire pain. Patients would have to submit two written requests for the medication, and a physician must inform them of the risks and alternatives. If a patient is suffering from a psychiatric condition, such as depression, counseling would be required to determine whether the person is competent to request aid in dying. Days ahead of the hearing, written testimony poured into the Public Health Committee, which is weighing the bill. Children who watched their parents die in agony pleaded with lawmakers to pass the measure. Others, including religious officials and advocates for people with disabilities, expressed sharp opposition. Several others argued in favor of the proposal. A retired doctor described the helplessness he felt while treating terminally ill patients. A breast cancer survivor said she fears her cancer will return and she will suffer. A handful of residents simply want the option. Helen Earnshaw remembered feeling powerless as her mother’s Alzheimer’s worsened. During the 10 years she resided in an assisted living facility, her mother lost her memories and her quality of life plummeted. “I want some control over the end of my life,” she wrote.